ST. GEORGE – A part of 100 South between 300 West and 400 West was temporarily blocked off Thursday afternoon due to a vehicle collision involving a motorcycle. 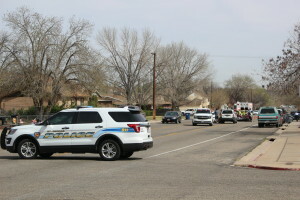 The accident occurred about 1:30 p.m. when a Gold Mazda passenger car allegedly pulled out in front of a motorcycle that was westbound on 100 South, St. George Police Sgt. Sam Despain said. The motorcycle rider received minor injuries in the incident and did not require transportation the hospital by ambulance. The motorcycle was towed from the scene. The Mazda driver initially left the scene but was located soon after by police and cited with failure to yield. Travel on 100 South in the area of the accident was reduced to the westbound lane as responders dealt with the scene.